In my post, “Let’s Get Together,” I pointed out the importance of not going alone on our spiritual journey, but rather enjoying the company fellow travelers and the collective safety of going together. 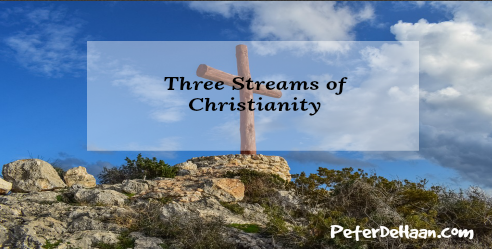 Check out all three, as each is roughly aligned with a major stream of Christian thought and practice. For me, one of them I mostly resonant with, another stretches me in a good way, and the third frequently irritates me. While each response to the three magazines has merit, it is the third one is most beneficial. After all, if I only read articles that I agree with, what good is that? However, when I am exposed to sound, biblically-based thoughts that are foreign to me, my perspective of what it means to follow Jesus widens and my acceptance of others becomes more inclusive. After all, isn’t this what Jesus taught?